A fetch is a simple and easy spell working for those interested in and/or who work with the Faerie realm. Since the enclosure of the natural world and the over simplification of the Christian and other Judaic traditions and since the formation of them as state religions, the Faeries have been all but pushed out of houses and churches, and buildings of common meeting place. Seen as being either demons or fallen angels, Christians helped to isolate them from allowance into our homes and hearths. These are the genii loci, the nature spirits, the guardians and the tree spirits, etc. House Faeries have historically always been allowed entry to our homes and they are different from the rest of the Fey realm. There are still traditions in which the Faerie are seen as other than in God’s light and therefore must be banished before any ceremony or divination can commence. As those who feel called to the ancient pathways return, as we open the doorways, so too the Fey will call back to us. The Fetch is a charm which will help you in your work with the Fey and nature spirits. It will be a home and a way for the Fey, when on your person, to enter into your home and other buildings. There are many liturgies to understand further work with the Fey, including cultural work and lore. Our own Arch Druid Ellen has several books in which pages you will be able to increase your knowledge and curiosity of the Fey. See also the works of R.J. Stewart for work with the Fey explicitly, and the books and poetry of Yeats and his contemporaries, which are a valued resource for Celtic folk tradition. Bring bells to call out to the Fey, they love the sound! Ground and center and determine where you will be searching for the root and stone. Any wooded area will do, this can even be your backyard, if trees are present. Bring bells to entice the Fey to come out of their hiding places. When you have located both root and stone find a tree or clearing in the woods (or if in backyard do the same). Call out to the Gods of the Celts to part the ways for this work. If you do not feel the “ways” parted, such as a change in the air, a sudden breeze, or an inner knowing in your gut, do not fret. Simply ask again. We are petitioning the Gods and the Fey, and it sometimes takes more than once or twice to do so. Call out to the Fey now. 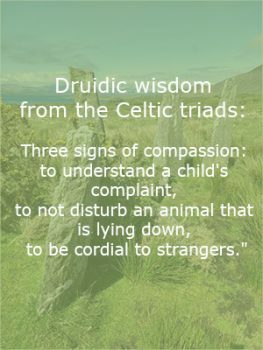 Calling in their Gaelic names is best, since we are working with Celtic spirits. (note; we are lucky to have some amazing bards amongst us, with some brilliant songs and chants in Gaelic, so of you who I speak of I hope to see your words for the group to share, we want to see your magic). Once you sense the petition to the Fey has been received you will now take the yard of thread, wool, etc. and charge it with your breath, your hair or your spit (fluids of the body hold great magic). Once the yarn is charged you will bind the root to the stone with seven knots, each knot a wish or blessing for your work with the Fey. Once this is done you will walk backwards seven times in a circle or around a tree (walking around a tree is double fold for we are adding the magic of the tree and the stability the tree gives as walking backwards is not the safest), as this is a traditional entry point to the Fey. Sing, chant, hum, or meditate on each step bringing you deeper into the gateways of the Fey. *NOTE: It is best to gather materials on the way in your walk. However, with planning and modern life, we do not see this as necessary and to have the materials at hand before venturing out will save you time on this walk, if time is of importance.